With diesel power, available 4WD and a commercial truck chassis, Dynamax’s new Isata 5 30FW is a long-haul looker. America has always had a love affair with trucks. Whether pickup, semi or something in between, trucks represent the values that our country was built on: hard work, family and the American dream. They’re reliable friends that stand at the ready to help us move, haul a trailer or deliver goods to a waiting customer. And yet, very few motorhomes are built on a truck chassis. Quite frankly, we’ve always wondered why. Trucks are typically better equipped to carry loads than their popular van counterparts, with heavier frames, more powerful engines and bigger brakes. Comparing apples to apples, trucks usually have roomier cabs, more legroom and bigger seats as well. We’ve heard some RV manufacturers claim that truck chassis aren’t/haven’t been popular with consumers because they ride rough and are noisy, particularly diesel models. Today’s trucks, even heavy-duty diesel models, are well-equipped, comfortable and very quiet. Fortunately, Dynamax, a division of Forest River, shares our point of view. 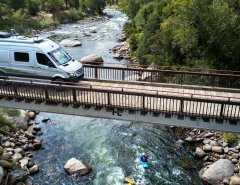 The company has made a name for itself building what it calls luxury “Super C” motorhomes atop commercial truck chassis, and recently introduced a new line: the Isata 5 Series, built on the venerable RAM 5500 heavy-duty cutaway chassis. 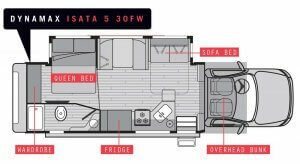 Last year, Dynamax expanded on the two-floorplan Isata 5 Series family with the 32-foot 30FW. Equipped with a single full-wall slide and large cabover bunk, the 30FW strikes a much-needed balance between diesel power, high-end features, family-friendliness and affordability (relatively speaking, of course). The test rig was also equipped with the available factory 4WD, a benefit that could come in handy on lesser traveled roads or during inclement weather, both of which are possible in the foothills of California’s Sierra Nevada. So, that’s where we headed last November to test the new Isata 5. Cruising on scenic U.S. highway 395, we were impressed with the Isata 5’s smooth ride, predictable handling and relatively quiet interior — only the pockmarked pavement on the outskirts of Los Angeles caused minor squeaks or rattles. Power from the high-output Cummins 6.7-liter diesel was also more than adequate; 325 hp and 750 lb-ft of torque may not sound like much for a diesel coach these days, but we had no trouble cresting highway grades at 65 mph. The power-adjustable Leatherette cab seats with white stitching were comfortable and supportive, but we did notice something missing the moment we climbed into the cab: a center console. At first it seemed strange that Dynamax would overlook such a common feature, but when we thought about it, we understood why. As it is, the transmission tunnel is almost level with the living room floor, so removing yourself from the cab and walking back to the living area already requires some flexibility. With a console in the way, it would be practically impossible. If we owned this coach, we’d probably purchase an aftermarket console that could be moved when needed. Obviously, the cab’s rearview mirror is rendered useless by the presence of the living area just behind it, but Dynamax remedies this problem to some degree with a combination digital rearview mirror and backup camera. Push a button, and you can see what’s behind you at any speed, and it also comes on automatically when backing, which is great. Less effective in our opinion is the integration of sideview camera views in the display. The large sideview mirrors provide great visibility on their own, and we found that the camera image wasn’t shown until the lane change was nearly complete anyway. We arrived in the shadow of Mount Whitney just before sundown and began setting up for the evening. Illuminated multiplex switches for the awning, as well as the exterior, cargo and entry lights, are located just inside the door, along with a master light switch. Located just above and behind the driver’s seat is the command center, which in the test unit consisted of controls for the slideout, digital solar controller (part of the $1,033.50 solar package) Magnum inverter/charger, Equalizer Systems Auto-Level jacks and the air conditioning/furnace. On the rear wall above the dinette is also a Precision Circuits touch panel that has intuitive icons for the lights, tank/battery levels and more. The designers of the Isata 5 definitely had entertainment in mind when they planned this coach. Not only is there a large, armless awning with LED lighting and wind detection, but also a 32-inch exterior TV located in a lockable compartment on the curbside. An automotive-style head unit in the compartment below provides sound to the dual exterior speakers, and the test motorhome was also equipped with a feature that Dynamax is considering offering in future models: under-chassis LED lighting. The system offers a variety of colors to choose from, and is controlled by an app downloaded to a smartphone. It’s a festive feature that can help others find your campsite, or just let fellow RVers know you’re the party people. Come morning light, we were struck by how good looking this motorhome is. Resplendent in the full-body Cosmic Blue exterior paint scheme complemented by silver/gray tones and tinted privacy windows, the long and low Isata 5 drew small crowds wherever we stopped. It’s also as functional as it is handsome, with exterior storage that is both generous and expansive. The gray Rotocast plastic compartments are lighted, and the main compartment on the passenger side features a narrow section that is almost pass-through. We found this an ideal spot to stow folding chairs, while the rest of the compartment easily accommodated an ice chest and a large hard case for our photo equipment. The side opening doors feature hydraulic struts, and securely slam shut. 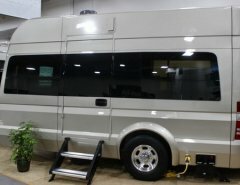 Overall, there seems to be more than enough exterior storage space in this motorhome, especially considering its comparatively modest dimensions. 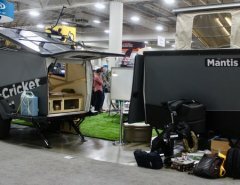 In travel mode, the living space feels narrow due to the above-floor slideout that encroaches on the walkway between the cockpit and the rear of the motorhome. Some caution must be exercised here to avoid tripping, especially when the motorhome is underway. However, once you’re at your destination, this small sacrifice seems well worth the effort; the living area practically grows twofold when the slideout is deployed, forming a welcome space for entertaining. 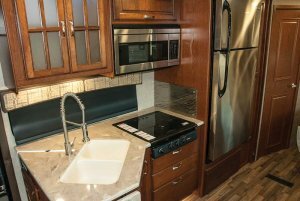 The fixed dinette easily accommodates four adults, and sliding drawers beneath the bench seats, a new feature for 2018, have plenty of room to stow extra blankets, pillows or other items. Behind the driver’s seat are a pair of theater seats that are comfortable, but don’t recline — and we found that the footrests were on the short side for longer legs. They were also a challenge to stow, but the mechanism will likely loosen up over time. We love motorhomes with overhead bunks. Perhaps they recall the bunkbeds we slept in as kids, or maybe it’s just because they feel cozy, but the one in the Isata 5 is particularly inviting. First of all, it’s big at 54-by-80-inches, so even two adults (or adult-sized kids) will be comfortable here. The 39-inch flat-screen TV is located at the foot of the bed, and is located on a swingout bracket so everyone in the living area can enjoy it. There are also windows at both ends, cup holders, a small ladder to climb up on and a privacy curtain when you’re ready to turn in for the night. 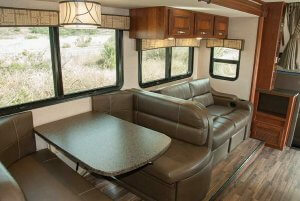 The dinette also converts into a bed, but you should be prepared for fights over the bunk area. The galley is smallish with only one full-size overhead cabinet, but is otherwise nicely equipped. The solid-surface countertop with extension and sink covers offers plenty of room for meal prep, and the double-bowl sink features an industrial-looking spring gooseneck faucet with integrated sprayer. We also really appreciated the garbage port just behind the sink that drops refuse into a full-size kitchen trash can in the cabinet below. Underneath the Suburban three-burner cooktop are three large drawers, but no oven. You won’t miss it, though, as above the cooktop is a Sharp residential convection/microwave oven finished in stainless steel. Next to it is a 16-cubic-foot residential stainless-steel refrigerator, which operates on two deep-cycle house batteries and an inverter system when not plugged in. The aforementioned solar package, with its dual 100-watt panels, should make it possible to operate the refrigerator consistently when dry camping. Finally, a narrow but tall pantry houses three pull-out drawers and offers more than enough space for dry and canned goods. The large full-wall street slideout also incorporates the queen-size bed, located across from the rear bathroom. Because the mattress would make contact with the bathroom wall when the slideout is in the stowed position, the mattress is bisected so it can be folded during travel. Getting ready to sleep in the evening requires simply that the bed be folded down, and the iCool gel-infused memory foam mattress was very comfortable. The bathroom is also unusually large, featuring a porcelain toilet and fiberglass shower enclosure with brushed-nickel fixtures to the right, and a good size sink vanity behind the door. There’s plenty of room for essentials on the sink countertop, storage underneath and a medicine cabinet with mirror. There is also a magazine rack at ground level in front of the toilet, but we would probably give up this feature in favor of more foot/legroom when perched on the throne. At the rearmost part of the interior is a wardrobe with a mirror and six drawers. Some level of compromise will be required here, as the closet is on the small side and access to it is a bit tight, even when the slideout is deployed. If you want access to clothes and other items during travel, it’s best to do what we did and keep your essentials in a duffle bag on the bed platform. Drawer space is really only adequate for two or three people, but we did appreciate the fact that closet and drawers were cedar-lined and well-finished. We would be remiss if we didn’t mention that the test coach had a weight issue, namely a front axle that was at its gross axle weight rating (GAWR) limit of 7,000 pounds with no passengers up front or cargo. We contacted Dynamax about this, and the company spokesperson explained that the test motorhome was an early prototype that had not been fitted with the heavier front springs that increase the chassis’ front GAWR to 7,250 pounds. While loading heavier items in the rear will help, potential buyers should keep this weight issue in mind when considering this model — or other floorplans in the product line — to prevent overloading. Before we knew it, it was time to break camp and head back to Los Angeles. But unlike the usual grind through the concrete arteries of the inner city, we knew this would be a drive to enjoy. The Dynamax Isata 5 30FW is a well-equipped rig that should tick most of the boxes a midsize motorhome buyer is looking for, weight and payload considerations notwithstanding. And perhaps best of all (for some buyers) it’s got the soul of a truck. Reprinted from MotorHome.com, February 27, 2018.